The boys and I took the week to read through the book "Lentil" by Robert McCloskey. We drew all sorts of learning activities from it. On Monday, we went to our world map and found Ohio, where the story takes place, and then coloured the American flag. On Tuesday, we read a couple of children's books on war and soldiers, based on the Memorial Park in the town of Alto. After that, the boys tried illustrating the story by drawing town stores of Alto. On Wednesday, we tasted sour lemons to mimic the climax of the story (you'll have to read it to understand if you haven't already) and then turned sour into sweetness with lemons into lemonade (pictures below). On Thursday, after reading "Lentil" for the fourth day in a row, we had a short discussion on fractions and musical notes (which came from Lentil's harmonica), and then Abishai dictated a story (which I typed out) about pirates and dragons that included the story elements of CONFLICT and CLIMAX. He finished by illustrating his story. Putting on some sour faces eating lemons. Boiling the water and sugar. This lemonade recipe called for 6-8 Tbsp of sugar for every 2 cups of water. I reduced it to 8 Tbsp of sugar in total for 6 cups of water. Abishai and Micaiah took turns squeezing the juice from the lemons. Tired baby Asher kept trying to play in the garbage. He's here to stay until the lemonade is made. Squeezed lemon juice. Doesn't amount to much, does it! The boys filling their cups with ice. Pouring hot lemonade over ice to cool it off. Asher taste-testing after waiting so patiently. Taken from our book "Lentil" Old Sneep sucking on lemons. After the goodness of fresh lemonade, the boys settled into their tent forts in the living room to enjoy some quiet reading. 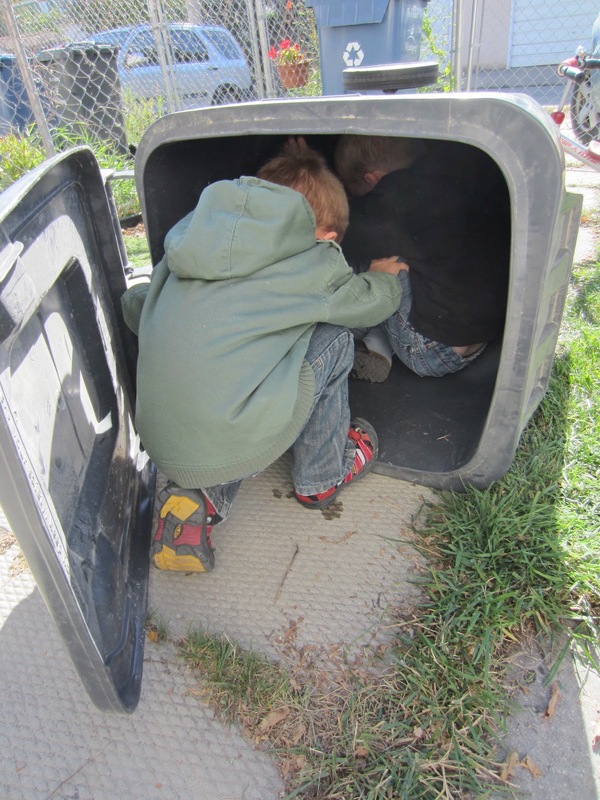 Our late-morning play consisted of making forts out of our new City of Winnipeg garbage and recycling bins (while they are still clean).